Cuba will not rejoin the Organization of American States, even though the multinational organization has lifted the 47-year-old suspension of the country’s membership, a Cuban official said Thursday. Ricardo Alarcon, president of the National Assembly, made the announcement to reporters. Former Cuban President Fidel Castro had said earlier this week that Cuba had no interest in rejoining the 35-nation group. Cuba was suspended in 1962 as a result of efforts led by the United States at the height of the Cold War. The United States had broken diplomatic relations with the communist island nation in 1961 and established an economic embargo the next year. Although the OAS lifted Cuba’s suspension Wednesday, Latin American leaders did not automatically welcome the nation back. 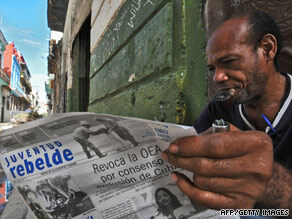 Instead, the organization set up a mechanism by which Cuba could rejoin. Much of the dialogue would have centered on human rights. U.S. Secretary of State Hillary Clinton said she was “pleased” with that decision, which came on a voice vote with no opposition. The United States had sought to obtain concessions from Cuba this year in exchange for readmission to the OAS. In particular, the United States wants greater political and personal freedoms for the island’s 11 million citizens. Cuba had rejected any preconditions.